Last week I got a postcard from the lovely Annie, whom has been living in France for the past several months as a bike tour guide. (Pretty rad, right?) 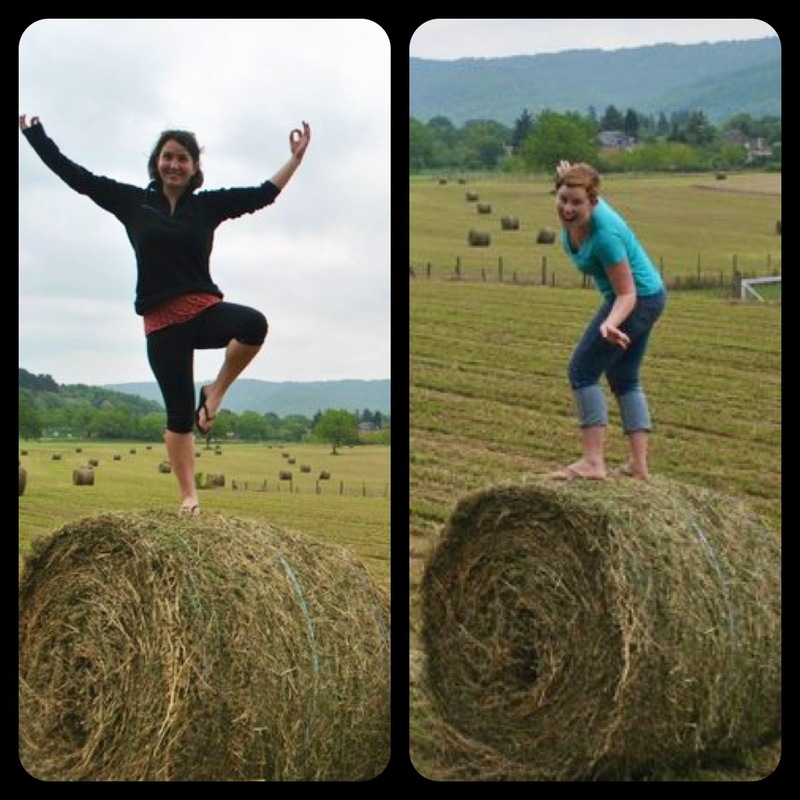 Mine came straight from the Dordogne in the southwest region of France where the two of us spent a week a couple of years ago, touring the country and cooking up confit de canard and frolicking through sunflower fields. 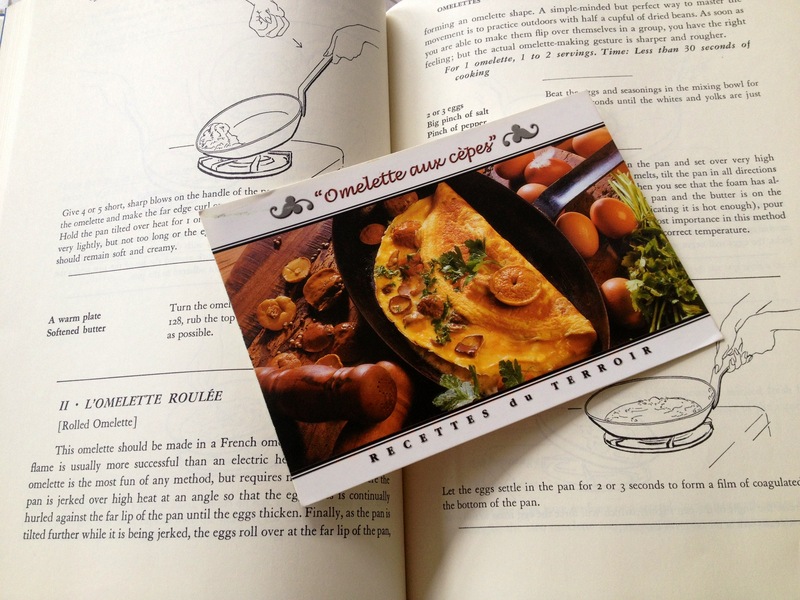 This postcard has “une recette du terroir” – a recipe of the region – a mushroom omelette. 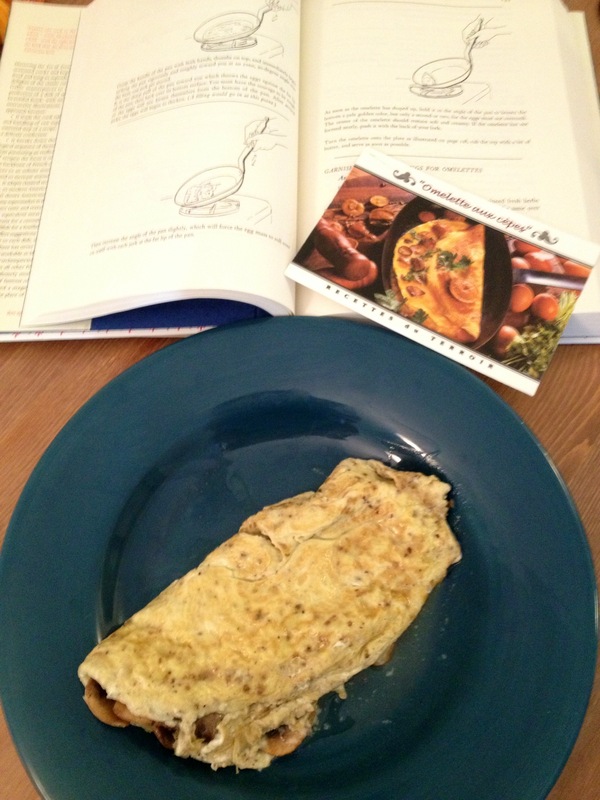 She suggested that I make it my recipe of the week, so I did :) I busted out my Julia Child Mastering the Art of French Cooking and read through all NINE pages she has on omelettes. I thought I knew what I was doing!…clearly not. There are two kinds that she teaches you about: a scrambled omelette and a rolled omelette. I tried it both ways, and while the former is easier, the latter feels fancier. I still need to practice my technique, but I didn’t have a crowd to cook for, so who wants to come over for omelette brunch chez moi?! 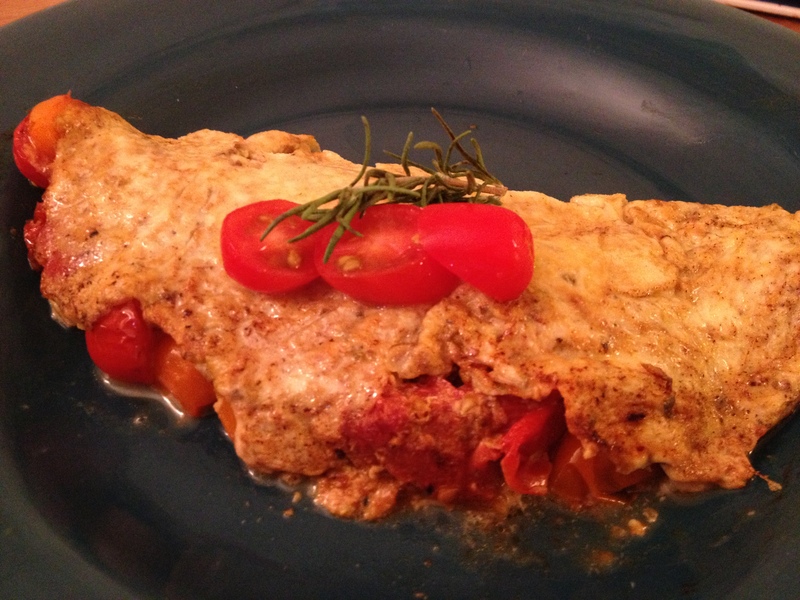 But I tried the rolled omelette last week with the mushroom filling as the postcard suggested (if you hang in, I’ll show you the terrible picture I got of it, but you can tell that the form of it is just so much prettier), and today I did a tomato herb scrambled omelette. Both delicious – I followed Julia’s instructions as closely as I could, so naturally I finished it off by melting a little bit of butter on top of the finished omelette. …Apparently that’s what I’ve been missing all these years. But let’s be honest, butter makes everything better. Allez! Omelettes for breakfast! Remove from the heat and place in a bowl ready to go when it’s time for the filling. Once the butter is lightly browned, add in the eggs. Shake the pan back and forth with one hand and with the other, stir the eggs quickly using the backside of a fork. This should only take about 5 seconds until the eggs become custardy. Add in the filling at this point. Lift the handle of the pan and with the fork, gather the eggs at the far side of the pan. Let them hang out over the heat for a couple of seconds. Give the pan several sharp blows on the handle to loosen the omelette. Get your plate, tilt the pan and the plate towards each other, making a V. Flip the omelette over onto the plate. Voila! Melt a bit of butter on top, and enjoy! Envoyez les cartes postales chez moi! Je les adore! 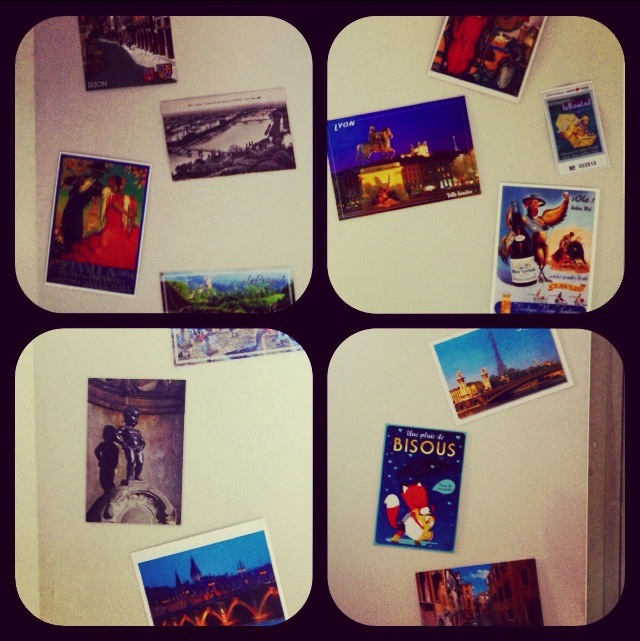 Send me postcards! I love them! Sent from my Nokia Brick.